Johnny Cash may have preferred this galaxy’s burning ring of fire to the one he sang about falling into in his popular song. The “starburst ring” seen at center in red and yellow hues is not the product of love, as in the song, but is instead a region of frenetic star formation. The galaxy, a spiral beauty called Messier 94, is located about 17 million light-years away. In this image from NASA’s Spitzer Space Telescope, infrared light is represented in different colors, with blue having the shortest wavelengths and red the longest. 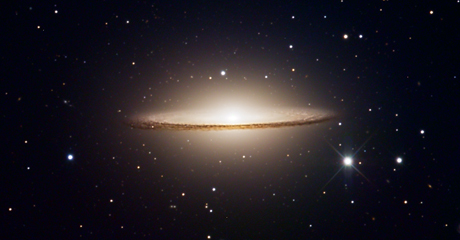 Starburst rings like this can often be triggered by gravitational encounters with other galaxies but, in this case, may have instead been caused by the galaxy’s oval shape. Gas in the ring is being converted into hot, young stars, which then warm the dust, causing it to glow with infrared light.